Dixie Stampede, Pirates Voyage and Smoky Mountain Adventures will hold auditions on Aug. 14-15 in Nashville, TN! 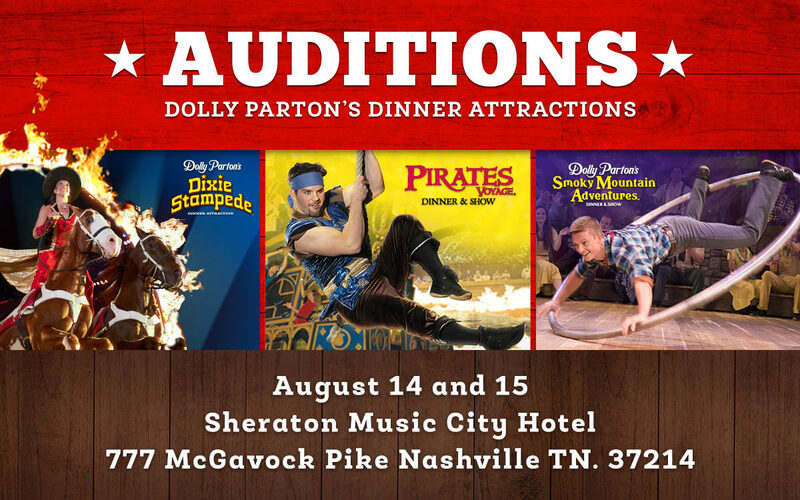 On Aug. 14-15, 2017, Dolly Parton’s dinner attractions will hold auditions for multiple roles at the Sheraton Music City Hotel located at 777 McGavock Pike in Nashville TN! Dolly Parton’s Dixie Stampede, Pirates Voyage and Smoky Mountain Adventures are auditioning actors for multiple roles. Auditions are held by appointment only. Call 865-774-8176 to set up a time. Please bring a photo and resume. These popular dinner attractions are looking for MC’s, Comedians, Pirates and Swashbucklers, as well as Storytellers and Country Characters. Call 865-774-8176 to set up an audition time.